A household name on the Irish music scene as part of duo Foster and Allen, Mick has toured the UK and Ireland for years accompanied by talented musician Moyra, and in that time they've amassed quite the community of friends and acquaintances - friends and acquaintances who would no doubt make for quite the vast guest list when the time came to tie the knot! 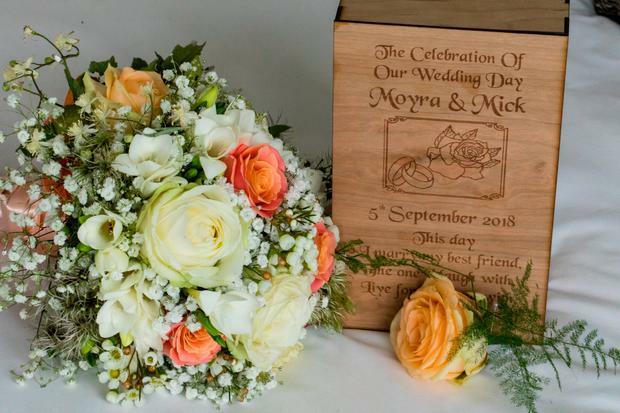 "We work together and live together and it was just a thing that we were just continuing on just the two of us," Scottish-born Moyra explains. "But then we just decided one day - well we better do this now and get it over with!" However when the time came to actually planning the so-called 'big day', the couple quickly put the breaks on. For Moyra, the idea of having to find a 'wedding dress' filled her with dread, while beginning to compile a guest list was cause for a headache. "We were thinking if we had a big conventional wedding - where do you stop? Where do you stop inviting people?," she says. "You could invite a thousand people and still manage to forget one." 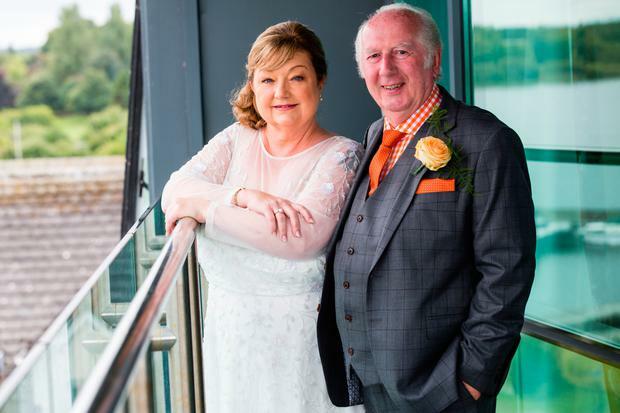 "We said we'll off and do it ourselves," explains Moyra, "we'll have a private wedding and we'll won't even tell the family! It was a bit of a cloak and dagger thing in the end." 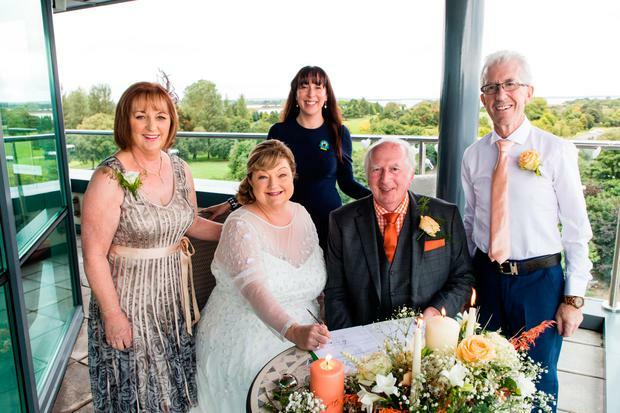 The happy couple exchanged vows in early September '18 on the balcony of the bridal suite in the Hudson Bay Hotel in Athlone, joined by their best friends of thirty years Theresa and Tommy Kilmurray as witnesses. And while they were certain Theresa and Tommy would keep schtum about the day, it turned out there was one person they hadn't vetted properly beforehand - their celebrant. "She turned out to be the niece of a friend of ours!" laughs Moyra, "and we nearly died because we were trying to keep it so quiet." 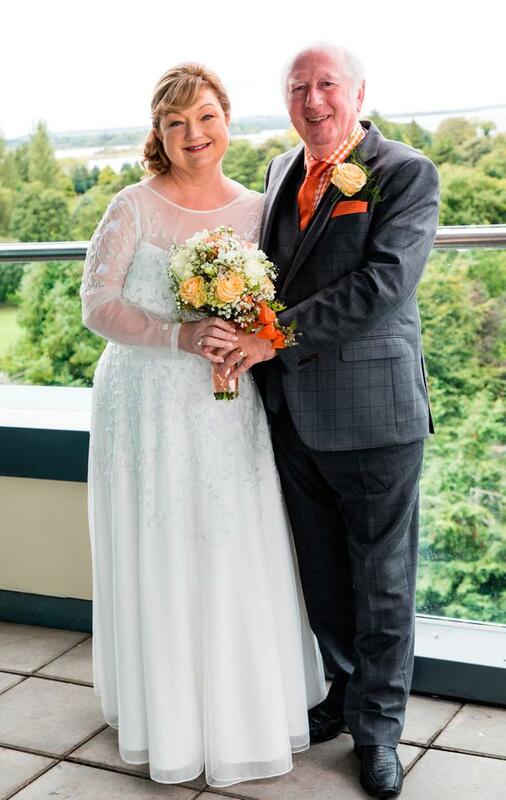 The pair exchanged vows in the sun with photographer Liam Kidney on-hand to capture the day, so that they'd at least have the photos to show their family after it all. Moya wore a dress she found online at Oxandales and was delighted with how it felt and looked on the day. 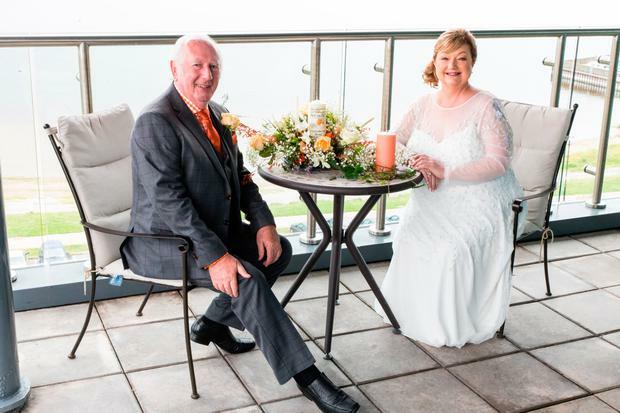 "Originally we weren't even going to have a photographer," says Moyra. "When we went over to the Hodson Bay first I said is there anyway we can do this over Skype like? I was half joking half serious." After the ceremony, the happy couple and friends were treated to a delicious dinner in their own private dining room. "They looked after us so well," Moyra says of the the hotel staff. "They were the best. Even when I told them it would only be four people, they treated us like it was a 400 person wedding. They had candles and lights and flowers in the bridal suite and had a private bar and dining room especially for the four of us. It was perfect... everything we could have wanted, we couldn't have asked for anything more." 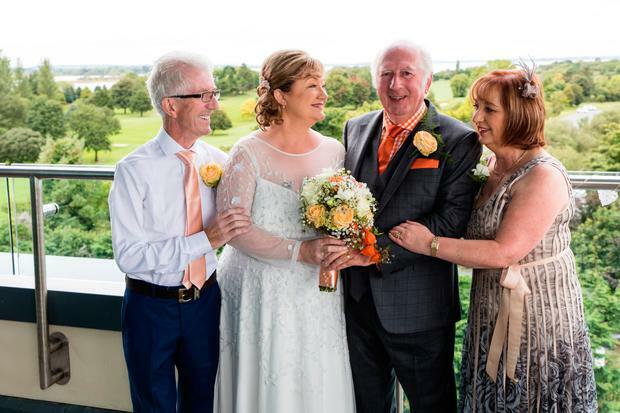 For the ceremony, the happy couple exchanged wedding rings engraved with the Mullingar symbols - the Children of Lir and The Catstone and cathedral - and had music to accompany their readings. "It was a lovely ceremony," says Moyra. "We had tracks on a CD playing songs by recording artist friends of ours so after we told them they were playing at our wedding - they just they didn't get paid but they were there!" The couple have yet to celebrate their newlywed status with family and, as they are off again to tour the UK until the end of November, a 'wedding party' won't be happening soon. However Moyra says once their daughter is back from her posting for Goal in South Sudan, they might have a dinner around Mick's birthday time in early December. Then it's back on the road for Foster and Allen and co again in the new year.